The LCU H390 ADRI LI as it was launched from PT DRU's shipyard in Lamongan. Photo c/o PT DRU. 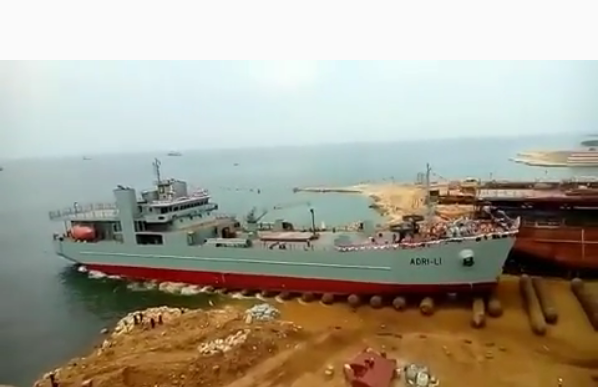 Indonesian shipbuilder PT Daya Radar Utama (PT DRU) launched an indigenous-designed and built landing craft utility (LCU), wherein two (2) ships are being built under contract from the Indonesian Ministry of Defence for the Indonesian Army (TNI-AD). The design is known as the LCU H390, has an overall length of 99.2 meters, a maximum beam of 16.4 meters, deadweight tonnage capacity of 1,500 tons, and a maximum speed of 14 knots. The first ship of the class, with hull number ADRI LI (ADRI 51) was launched on 23 March 2019 in PT DRU’s shipyard in Lamongan. The ship is expected to be completed within 2019.